Beautiful self-catering holiday apartments set in a converted L’Aquila villa on the road that winds around the medieval hilltop town of Santo Stefano di Sessanio in L’Aquila province on the way to Rocca Calascio & Castel del Monte. Villa Valsi comprises five apartments, perfect for an Abruzzo walking holiday with an extra bonus of the provision of breakfast. Furnished & decorated with an eclectic charm that nods to the history of the house, these five apartments provide the perfect base for exploring the spectacular landscape that surrounds Santo Stefano, including Campo Imperatore, and are ideal for those looking for an affordable holiday apartment in one of Abruzzo’s most famous areas of natural beauty. Villa Valsi was built on the cusp of the C20th by the owner’s grandparents, an old Santo Stefano family, when they first got married. Heirlooms, portraits & artwork in these newly restored, light & airy apartments highlight the changes family and surrounding area undertook as the century evolved. 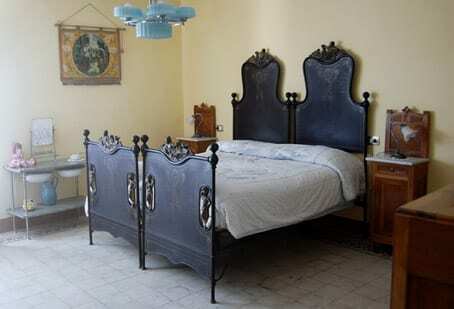 Depending on which apartment you stay in, there is an art deco bed, a vintage record player, a cabinet valve radio, a child’s traditional rustic wooden cot and even antique photographs of the local area & family that help you connect with the past, and offer a wonderful insight into living in one of Abruzzo’s most interesting provinces. 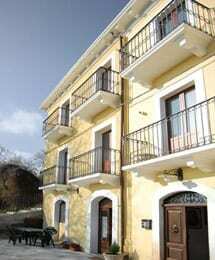 The front-facing apartments all have small balconies that look out onto Santo Stefano di Sessanio. Each apartment sleeps from 2-6 people, and can be rented by small groups or independent travellers holidaying in Abruzzo. Each has a modern walk-in power shower, washing & ironing facilities and a fully equipped kitchen where you can cook yummy ingredients from one of Santo Stefano’s excellent food shops specialising in local ingredients, or the nearby supermarket in Barisciano a short drive away. Off-road parking is available. For those that would like to sample the wines that Abruzzo has to offer, or indeed wines & beers from elsewhere, Santo Stefano di Sessanio has two bars; the town also has three very good restaurants for those who don’t fancy cooking after a long day’s travelling or exploring. George Clooney and the film crew of The American stayed in the town and as the saying goes ‘if it was good enough for them…’ The towns of Castel del Monte & Calascio are also only a short drive away, each with at least one excellent restaurant for sampling the local cuisine of L’Aquila. Located in the Gran Sasso e Monti della Laga National Park, Santo Stefano is nestled below Campo Imperatore’s majestic undulations, a walking and hiking paradise for all levels of experience, with stunning Apennine high meadow vistas, plus fauna and flora that will excite all naturalists. Explore one of Italy’s most photographed & filmed forts, Rocca Calascio, the nearby saffron town of Navelli, and one of Abruzzo’s most important art treasures at Bominaco, all within easy reach by car. If you want to learn how to cook some of the local dishes, a 1-day cooking course can be arranged, as well as a night-outing for those that like to star-gaze via the Campo Imperatore observatory; alternatively you may like to visit some of the local food suppliers and see how pecorino cheese and salami are made. This too can be arranged by your host Rita Visioni, who speaks fluent English (plus her husband is American). If you fancy ski-ing, the nearest ski-resort is Assergi only a 30 minute drive. The apartments sleep: 2, 4, 6 people. Single travellers’ can hire an apartment with a very small surcharge; available for nightly bookings all year. Prices are charged per person and include breakfast provisions of home-made cake or cookies, tea, coffee, milk, fruit juice, all sheets and fluffy white towels! High Season – €37 – New Year’s Eve, Easter, July & August. Mid Season – €35 – Nov, Dec, Jan, Feb, Mar & April (months that require central heating). Low Season – €30 – May, June, September & October. Free for children aged 3 years and under, children under 12 receive a 50% discount. There is no minimum-stay period. Bel posto !! favoloso !